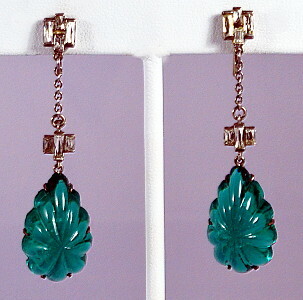 1910's vintage Edwardian era drop earrings. Sterling, emerald green glass and paste. Fluted dome emerald green glass tear-drop shaped drops. Sterling silver setting. Sterling chain extension from button to drop with paste baguette accents. Baguette button at screw backs. Marked STERLING on setting back. All original Titanic era, true 1910's vintage.